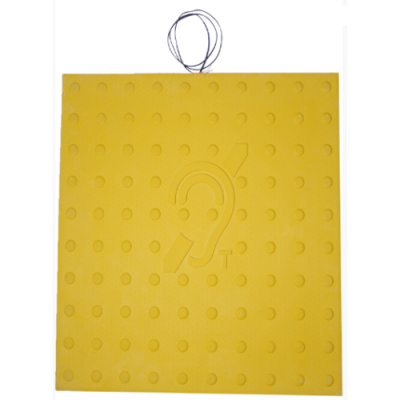 Designed to provide sound enhancement for people with hearing aids, the Yellow Loop Mat for Geemarc LoopHear 160 and LoopHear 150 Listening Aids is ideal for use in public spaces where additional support at services or information displays may be required. Designed with safety and convenience in mind, it can help to enhance the quality of listening in public for the hard of hearing. The Yellow Loop Mat is designed for use with the LoopHear 160 Induction Loop Amplifier and the LoopHear 150 Local Magnetic Loop. The LoopHear 160 and LoopHear 150 provide wearers of hearing aids with sound transmission in public to ease the experience of interacting with others. When used alongside the Yellow Loop Mat, sound can become clearer for wearers of T-coil hearing aids. By standing on the Loop Mat, the sound can be easily transmitted from the amplifier through the mat to the hearing aid. The mat can be placed in front of exhibitions or at counter services, helping to ensure that anybody with hearing difficulties can stand in the most effective location to receive the best sound available. The Loop Mat is secured in place by applying adhesive to the surface of the mat itself. It is best used indoors, and will remain fixed in the desired location for optimum use. As the mat features high resistance against abrasion and fire, with NRB rubber also providing antistatic properties, it offers assurance that satisfying levels of safety is offered.